The Secret Society Ball: La Belle Époque will provide a romantic Valentine's evening with a red carpet entrance, masterful cocktails, tarot card readings, cabaret, music, an exquisite dessert bar and many more Victorian and Edwardian delights. 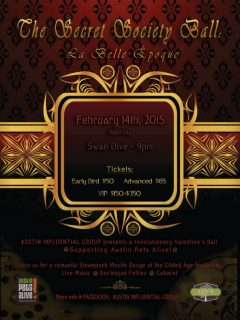 This is the third annual charity ball for Austin Pets Alive! produced by Austin Influential Group.